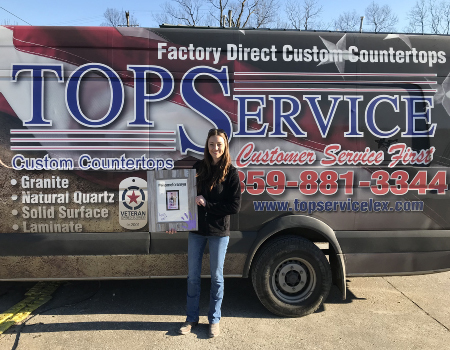 Top Service has always offered Factory Direct Countertop Replacements for customers wanting to upgrade their existing Kitchen and Bath countertops. Our systems are focused on our customer service, resulting in one of the easiest remodel projects you can do. With one of our many products we can offer our customers, GRANITE, QUARTZ, SOLID SURFACE, and LAMINATE countertops. Not only will you add value to your home, but you will also change the way your kitchen looks, and how you use it. Top Service can offer our customers everything they need to replace their countertops, or as little as needed to be done for our do-it-yourself customers. Request a Quote online. You will notice our dedication to customer service the minute you contact us. Business registered with the state of KY- July 11, 2001. Amya Catching, a young girl who has bravely faced adversity, is getting ready to settle into her new home. It’s been over a year since Catching was shot while staying at a friend’s home for a sleepover. The 12-year-old was paralyzed but her positive outlook inspired people around the city. Several organizations have gotten together to build a home for Amya that is specifically equipped for her paraplegic needs. The lay out is all open to help her get around with her wheelchair. BIA Cares, a part of the Home Builders Association of Lexington says they’ve raised almost $200,000 to build this home.